When we talk about Bet365 Poker, we should keep in mind that it is a part of the bet365 Group Limited. And that is one of the largest and world famous UK betting and gaming groups with a gambling license in the UK. To add to that Bet365 Poker is now also part of the iPoker network, which is powered by Playtech. And we all know that iPoker network is leading way for online poker in Europe. This is telling us you can expect a large amount of traffic at all times. That means if you want to play some Holdem and Omaha no matter where you live, you will find always find action on their tables. This room has an extensive list of daily tournaments with big prizes on offer with common ones such as Sit & Go's running 24/7. 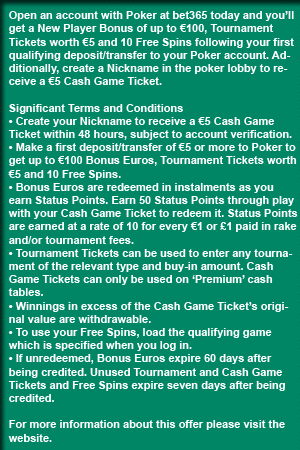 There is no rakeback deal at Bet365 Poker, but they have a solid loyalty program which will give you some returns. The returns are not big as you will find one some rakeback portals, but the VIP program is still one of the best things at Bet365. In my opinion, Bet365 is a good choice for poker players with different standards. The poker software does come in a MAC friendly version because it is possible to play online in your browser. Bet365 now enjoys the benefits of the iPoker network, the most noticeable transformation has been to their table design. The tables, although not resizable, now include a dealer and all players have nice avatars you can choose from. Speaking about the plus side of the software I need to state that it is very clear and you can see other players taking place at the tables. It is also easy to use and I never have problems such as taking a seat at the table I wanted. The gameplay is smooth and comfortable, just like on the other iPoker sites. Also, the lobby has all common buttons in the standard places so everyone familiar with Playtech's software will be here just like at home. Some of the features that worth to mention include resizable tables, multi-table play up to 16 tables with Mini View option, and All-in percentages. Bet365 offers a decent selection of online poker games in fixed, pot and no limit options. The ones that attract the biggest share of players are Holdem and Omaha. It also offers an excellent assortment of Guaranteed and Freeroll tournaments with freerolls running every day having prize pools up to thousand euros. Regarding traffic, I have found most players at this site at the micro limit Sit & Go tables and Ring Game tables, especially for Holdem. Also, I must admit that the standard of play is pretty very poor at the lower stakes, be it tournaments or cash games. In general, the players have extreme difficulty playing post-flop poker and there are plenty of calling stations and fish. The poor play displayed is probably due to the cross-sell in customers from Bet365's successful sportsbook and casino product. This means good news for the poker players. Bet365 poker runs on customized iPoker software from Playtech. The software is available in many languages, it's very functional, fast and appearance is user friendly. Some of the features are: One Wallet System (one account for poker, casino, sportsbook, etc. ), Re-sizable tables, Multi-Tabling / Mini View, All-in Percentages are shown on the table, Betting Made Easy feature (pre-set bet amounts), Buddy-List, View Hand Strength feature (best hand is displayed in the centre of the table), Lobby Filters, Avatars, Calendar for tracking upcoming tournaments, Bonus Tracking, Game stats (Notes/Statistics/Hand Histories) and more. Regarding real money play ring games, I am still preferring Pokerstars because traffic is much better most the times. Only at Bet365's peak hours, you can compare their traffic volume. You can't go wrong with any sites that are part of the iPoker network when you are looking at tournaments traffic. You will find a plenty of tournaments 24/7. Because of their large base of casino and sportsbook players Bet365 Poker competition at the micro level and lower stakes tables is fairly loose, but high-stakes play will be more challenging. Although the table limits and rake can start at few pennies level, I recommend to go to their poker site and check yourself. Depositing into Bet365 account is pretty easy. There are plenty of options available to you so transferring money should take you no time. Deposit methods range from Visa and MasterCard, wired transfer to more modern electronic wallets like Neteller. Although I have used all of the mentioned methods I decided to try something different. As you already know Bet365 is UK based company and just like majority British operators they offer PayPal to deposit. Unlike their competitors, besides the UK they offer this ewallet to other countries and in my case that is a Germany. I was really thrilled when finding out that Bet365 is one of the rare poker sites that accept PayPal deposits from German players. When I tried to withdraw the money back to PayPal I needed to go through the KYC procedure and that took one day. The next day after approval I requested the withdrawal and after two hours the money was in my account. So if you decide to use the same payment method as me I assure you that it will work flawlessly. Customer supports of Bet365 Poker is reachable by e-mail, telephone and live chat. Their support is probably the most knowledgeable in poker industry so responses are not only fast, but also on the point.